'Write with all five senses' is a brilliant rule for working on description; but how familiar are you with each? Sight, sound, smell, touch and taste are five simple details that help make your fictional world come to life. Each sense is a powerful tool on its own way. Combined, they don't simply describe the world that events take place in – they offer the reader a full, immersive experience. Visual description is the most commonly used of the five senses in writing. In our increasingly visual-driven world, you need a richly formed setting for readers to explore. And the key to that is all in the detail. Lee doesn't portray the magical feel of Christmas in his memoir with basic descriptions of the tree's height, shape or colour. Instead, he gives close-up glimpses of visuals that highlight the fun of bringing the outside world in, with reference to 'snow' and 'feathery'. Most of us rely heavily on what we see. We use visuals to orientate ourselves, to distinguish between objects and to understand the world around us. So it’s important to give readers a strong visual image. You'll bore your reader with paragraphs of flat description. Every word must work hard and do more than just provide a vague visual summary. Be specific. Make sure your visuals also enhance mood and themes. And remember, verbs and nouns can describe as well as adjectives and adverbs. Linking visuals to mood and character emotion makes description feel like a natural flow of the story. Show the reader what the character is feeling by the way they see: is the building 'looming' or 'soaring'? Choose words that match and heighten character emotion. Laurie Lee described the Christmas tree with 'sparkling', 'feathery' and 'crown' to portray the light, happy and festive mood. The same tree could've been described with words such as 'spindly' or 'bulky', resulting in a very different scene. Colour is filled with layers of meaning, and its symbolism has been used in literature throughout history. While you don’t want to go overboard, the range of colours and words for all different hues can be used to add variation, depth and emotion to your scenes. Specific colours carry their own meanings and mood, but so do different levels of colour. Dull, drab colours can symbolise sadness, fatigue or disconnection. A brightly coloured dress can show that a character is feeling happy and excitable. Pick a person, object or place and describe it with three different moods or emotions in mind. Think of a colour that could represent each of your characters and settings. Use Pinterest to inspire more detail in your writing. Sound adds extra depth and meaning to a scene. An old, dark forest takes on different nuances of tension when the air fills with howling wolves, or with thick silence. In this example, a character hears a sound and so looks for the source. Stegner uses the fact that sound is less concrete than sight to his advantage, creating tension and mystery. The same way writers bring an image to a reader’s mind with description, they can do so with sound. Simply including ordinary, everyday sounds can heighten the sense of realism, and of being in the middle of the action. Sounds can be real, or imagined. Heightened emotion and fatigue can lead to misinterpreted sounds. A character full of fear might imagine footsteps behind them; a pining lover might hear the voice of their lost partner in a crowd. Sounds have a huge impact on humans. They can make us smile or cry, tense or relax. Various noises have associations that writers can take advantage of. For example, birdsong makes us feel safe, while creaking floorboards put us on edge. You can also control the volume and duration of the sound in your writing. Singling out and emphasising a single sound, such as a heartbeat or the trickling water, can adjust the mood and create tension. And just like a colour or object, sounds can be motifs and symbols too. Onomatopoeia are words that emulate a sound. The advice for YA and adult fiction is to use common ones – such as 'crash', 'thud', 'hiss' – sparingly, and uncommon ones never. But you can use them more frequently in young children’s books, and in visual media such as graphic novels and cartoons. Consider what sounds stand out to your protagonist. Imagine your scene is from a movie, and decide what sounds to include. Use YouTube to access a range of sounds remotely. Smell is often underused, but can be the most provocative of all senses. And unlike sight or sound, smell and the remaining of the five senses are experiences a novel can give, but a movie can’t. Proust recognises that smell isn't stationary – it moves around and interacts with us. It's also a fluid sense, difficult to pin down. So he remains flexible when writing it, the adjective 'furry' feeling natural despite what conventional logic tells us. Smell is linked strongly to memory and nostalgia. This is because when our brain processes scent, it travels through our memory and emotion sections. The catch with smell is that it works best when a reader has a memory of it. If you have a new or unfamiliar smell, use similes or focus on the emotion the smell activates and let the reader imagine the actual scent. You can provide more information with a single piece of well-written smell description than a paragraph of visual description. A hospital room could be described by its white walls, tall windows and lines of beds. But writing about the musty scent with a sharp disinfectant undertone gives a faster, more vivid sense of the room. 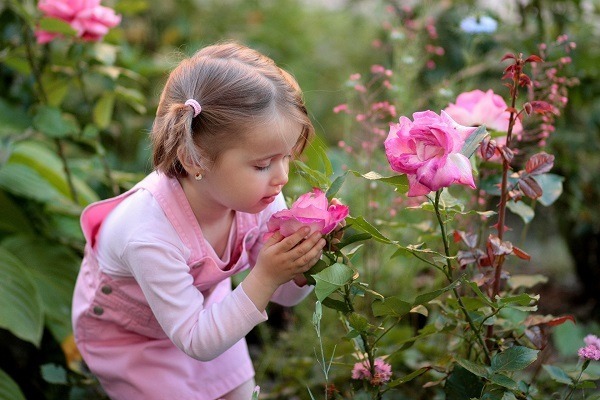 Smell is difficult to describe, simply because English doesn't have a big vocabulary for it. But writers have learnt to expand on the few adjectives, borrowing from other senses, using nouns, metaphors and even verbs. From this, smell can take on a powerful presence in any story. This is an opportunity for you to really get your creative juices working. The scent of a rose could be described as pale, quiet and soft. A cemetery could smell of longing. A young boy could smell of lemon sherbet. Choose a common scent and try describe it with the other senses. Look through your scenes and think what scent would best accent the mood. Read wine blogs and perfume sites to build up your smell vocabulary. Even if we don't realise it, we're always touching something. Our clothes. A keyboard. The pages of a book. The sense of touch is immediate; unlike the previous three senses, this one requires a physical connection. The opening of Dashner's novel creates a sense of place solely through touch. Due to this, the character is immediately in his surroundings, and reacts directly to the environment. Dashner also uses the touch sensation of sweat to portray the character's fear. Touch is a real, immediate sensation. It is happening now; you are feeling something now. And, being less subjective than smell or taste, it's easier to mentally share the experience. More than any other sense, touch gives the reader the illusion of being the character in the moment. Touch is personal. Hundreds of people could look at the same scenery, hear the same traffic noises, smell the same bouquet of flowers — but typically only one person experiences the same touch sensation at a time. A glimpse of this intimate sense links reader and character. We're always touching something. So, naturally, we filter it out and don't pay much attention to all the textures we come across in a day. Certain circumstances heighten our awareness of touch, such as unfamiliar objects or locations. Touch is a slow sense; it makes the world immediate yet unhurried. It's effective in calm, contemplative scenes with a mood of serenity, and in intense physical situations: a bar fight, a kiss, a football match. The contrast of this 'slow' sense with a fast-paced scene mix to emulate high adrenaline levels. Touch is a complicated sense. It's more than detecting whether something is rough or smooth, or hard or soft. Touch also includes temperature, vibrations, pleasure and pain. It can activate a few nerves on your skin, or all the nerves down your body. Be deliberately aware of your sense of touch for a few minutes, alternating between eyes closed and open. Practice describing and comparing different fabrics and building materials. Test how textures feel different in your hands, under your feet and across your skin. Food is an important feature of almost every culture on earth. It's the centrepiece of many festivals and holidays, and an integral part of our everyday lives. Taste is a subjective sense, and can reveal a lot about character and society. When describing taste, touch is another sense that is activated at the same time. Remember to also think about how different foods feel, what texture they have. Meals are often structured into our lives at certain times. So including taste in your writing increases readers' awareness of the way time passes within the story. Taste is a particularly good sense to use if your story comes across foreign cultures – real or fictional. The changing flavours and customs as your character journeys make your reader feel as if they've travelled, though they haven't left the chair. You may think taste is only for when a character sits down to a meal, but things get into our mouths at other times. A character falls and get a mouthful of dirt. What does the dirt taste like? Maybe they bite an attacker to escape a kidnapping. And what about an intimate moment with a lover? Taste is also linked to smell. When your character comes across a particularly strong smell, they may actually taste the scent when they breathe in the air. Taste is sensation that is easy to imagine. At the mere mention of cinnamon biscuits, you can already feel their sweet yet spicy flavour tingle in your mouth. Food is an important comfort in our world. So what food does your character think of when feeling upset or tired? Look up an image, and try to describe it as a flavour. When you can't taste something for yourself, use smell to guess the flavour. Read food blogs and magazines and note how they describe taste. When starting out, you may need to edit each sense into your writing individually. Go through a scene once for sight, once for sound, once more for smell and so on. But as you edit or write, your aim to is get to the point where you draw on more than one sense for a single description. The best way to improve writing the senses is to get out there, experience the world and reflect. Note how often you are aware of each sense. You'll likely notice your sense of sight most frequently, and taste the least – a ratio you should try emulate in your writing. If you struggle to balance how often you use all senses, experiment with writing the same piece of description with different senses. A character seeing a train station sign could instead hear the train whistle. The smell of fresh bread could be described as the sensation of a crunchy crust. All five senses have a unique and powerful impact on the reader. As you tackle your next writing task, bring your story to life with sight, sound, smell, touch and taste.